"Assuming the ranchers accept your proposition, what about the Indians? They have rights too." After Gene Autry's long-running contract with Republic Pictures expired in 1947, Gene signed with Columbia Pictures, which represented an upgrade in more ways than one. Columbia was no longer considered a Poverty Row studio like Republic, and it was able to give Gene both larger budgets and more ample running time, as well as classier publicity, in effect shifting him from B pictures to something a bit better, if not quite A pictures. 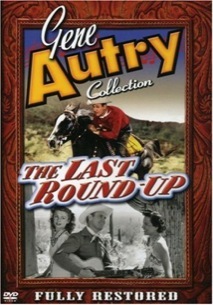 The first film under that contract was The Last Round-Up, which takes advantage of these benefits to offer a more complicated story even though its roots are still in the standard tales Autry had done for Republic. Set in the modern West, the story centers on the water needs of growing Mesa City, and the conflicts this creates with both the surrounding ranchers and the local natives. The city desires to build an aqueduct that will drain the surrounding territory and make it even more unusable than it is already. But Gene has a proposition for Mesa City that will be a win/win: the city will buy out the ranchers with sufficient money to allow them to find good land elsewhere, and also relocate the Indians to the idyllic Cedar Valley. But things are more difficult than Gene expects, since both ranchers and the tribes are attached to their homes and are disinclined to sell or move. In the meantime, wealthy Charlie Mason (Ralph Morgan, brother of Frank Morgan) and his devious son Matt (Mark Daniels) scheme to end up with all the land for themselves and either extorting a fabulous sum from Mesa City or allow it to die of thirst. There's a strong liberal streak to the tale, with Autry standing up for the rights of the natives and trying to allow everyone to get along peaceably. At the same time, while the first half tends to be rather talky, there are still plenty of action sequences: the picture features not one but two full-blown cattle stampedes, including the centerpiece one running right through the middle of Mesa City. The added running time allows for some interesting character bits that wouldn't have been shot in the briefer Autry outings; one of the most amusing is a disposable bit in which Gene convinces a taxi driver to let him drive, and its comic aftermath. Technology also makes a major appearance, with closed-circuit television being used to help convince the Indians that Cedar Valley isn't a trick or a trap; for much of the movie's 1947 audience this must have seemed like science fiction. The movie makes good use of Arizona's "Old Tucson," with the distinctive Mission San Xavier playing a prominent role and adding plenty of production value. The supporting cast is interesting, even without a comedy relief sidekick. Jean Heather (who had appeared in Double Indemnity) is the romantic interest, a schoolmarm who has a series of meet-cutes with Autry before getting down to business. Broadway actor Mark Daniels makes a good villain with an attractive exterior; he underplays the role to a surprising extent and it works in the context of the ambitious plot. A young Robert Blake (billed as Bobby Blake) continues to act as a young Indian, as he had done in the Red Ryder pictures the preceding few years. In an entertainingly prescient sequence, Blake plays baseball (badly) with Autry, who would go on to own the California Angels team. The treatment of native Americans is a little ambiguous; while Autry and Heather are firmly in support of them, the script at several points sends them on the stereotypical warpath, with a rallying cry of "If we're going to be treated like savages, we'll act like savages." At the same time, an uncredited Jay Silverheels has a sympathetic role as an Indian whose cattle are shot by racist city water workers, and who is beaten up when he tries to complain. Let's just say that the heart might be in the right place but the situation is handled with less than adroitness. Image Transfer Review: The original full-frame picture is a little disappointing after the recent spate of beautiful restorations of Autry's pcitures. The source print is frequently contrasty and a little dupey at times; white hats often blend into the sky giving the film an odd appearance at times. Other parts look fine, so this is most likely a shortcoming of the source materials rather than a transfer problem. There doesn't, however, appear to be any significant damage, since few nicks or speckles are visible and no serious tears. It's watchable, but not as good as usual. Audio Transfer Review: The English mono track also has its share of issues. There's a fair amount of crackle and noise throughout. The songs sound pretty good, with nice range for 1940s mono. The Phantom Empire Chapter Six "Disaster from the Skies"
Extras Review: The 1987 Melody Ranch Theater installment with Pat Buttram is even more rambling than usual, with anecdotes about Robert Benchley, Dizzy Dean and Irving Berlin here, although not much about the movie itself. The Melody Ranch radio show from December 7, 1947 carries a Pearl Harbor Day theme, and features a dramatization about the plight of returning disabled veterans that's quite timely today. Several galleries offer a couple dozen stills and a set of lobby cards and posters, along with a sampling of ad materials from the press kit. A rerelease trailer is a fine example of Autry ballyhoo. Finally, the sixth episode of The Phantom Empire (1935) is included in the "Centennial Extras." As usual, it's in nice condition and full of goofy sci-fi/musical western action and fun. Autry's first Columbia outing is an ambitious one, and it's not bad, but the print is in a bit rough shape, unfortunately.